Step inside Jerusalem’s newest landmark and be AMAZED. We’ve cut the ribbon on the Shalva National Center – the largest and most impressive facility of its kind. 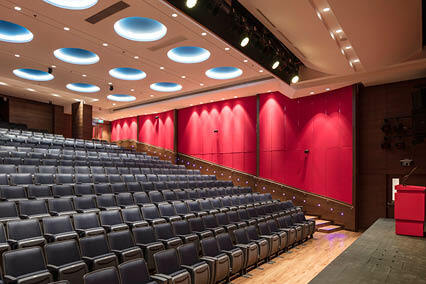 The Shalva National Center is Shalva’s newly inaugurated campus which houses all of Shalva’s programs and operates as an inclusive community center; hosting professional conferences, educational seminars, community-wide happenings, theatrical and music performances, and sporting events. The new center is located at the entrance to Jerusalem and was purposefully positioned by the Jerusalem Municipality to be the welcoming face of Israel’s capital and a representation of Israel’s strides toward innovation and inclusion. 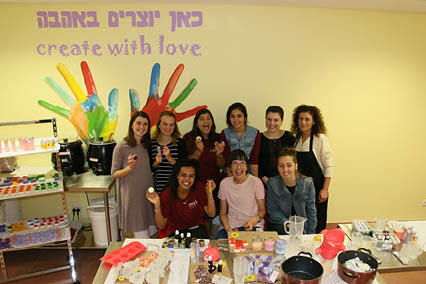 The colorful face of Shalva is one of the defining features of the organization. Designed with meaningful intention, Shalva’s open and unique architecture, variety of bright colors, quotes, art installations and murals are what make every visitor sense they’ve entered a special place. Even though people with disabilities and their families come to Shalva with challenges, the building itself imbues people with inspiration and hope. The Sports Center is a hub of community-wide, inclusive fitness activities for Shalva’s children and the broader public. 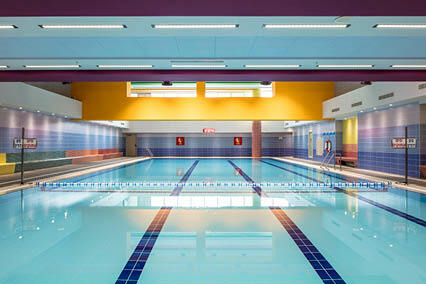 Shalva houses some of Israel’s largest and most advanced disability accessible sports facilities; including an expansive multi-purpose gymnasium, swimming pools that are specially designed for therapy purposes, completely accessible locker rooms, therapy rooms, and a fitness center with disability accessible equipment. Shalva’s Sports Center presents Israel’s disability community with new and unique fitness options for rehabilitative and recreational purposes. The Leisure and Activity Center houses several therapeutically oriented recreational facilities; including a drama room, music room, art studio, petting zoo, soft play area designed for older children, as well as a dental clinic. The floor also has twenty-one activity rooms and is home to Shalva’s After School Activity Center program for nearly 300 children and teenagers ages 6-21 with a variety of disabilities. 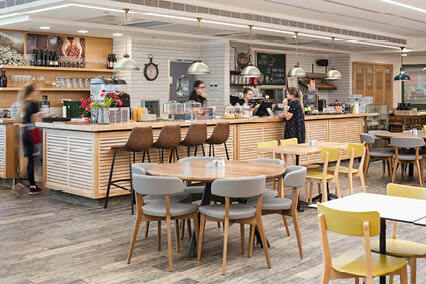 Open to the public, Cafe Shalva is a boutique cafe that is also an equal-opportunity work setting where an inclusive staff work as managers, waiters, and hosts. The cafe’s menu and management was developed in partnership with elite culinary establishments and its interior design is artistically crafted to inspire newfound understandings of inclusion and acceptance. The cafeי provides internship and employment opportunities for Shalva’s young adults and serves as a model of successful workplace inclusion. Positioned at the heart of the building, the Dining and Events Floor is one Shalva’s main centers of activity. It includes an expansive dining hall, a VIP dining hall and an outdoor amphitheater, as well as a beautiful synagogue and Beit Midrash. 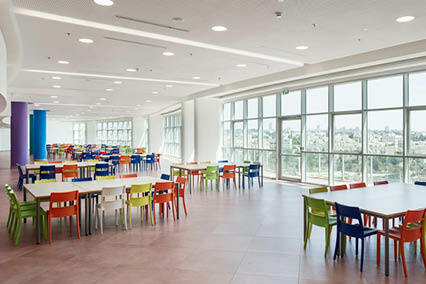 The dining hall seats up to 600 people at a time and has two associated kitchens: an industrial kitchen which provides 750 meals to Shalva program participants on a daily basis, and an educational kitchen where adults with disabilities learn basic home economics and culinary skills. The Respite Program allows nearly 200 children with disabilities between the ages of 6 and 21 to participate in weekly overnight stays throughout the year. The program provides a rare opportunity for children with disabilities to cultivate independence skills while their families experience a vital respite period. people come to Shalva’s auditorium for conferences on disability topics, cultural events, as well as theater and music performances. 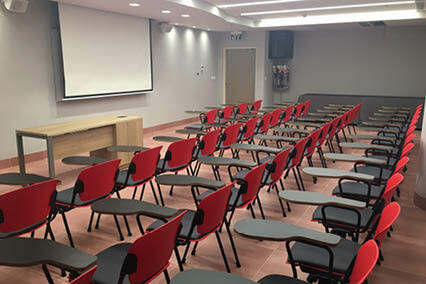 The Education and Training Center includes a large auditorium, several seminar rooms, conference halls, and a resource library; and offers a unique composite of therapy certification courses, continuing education seminars, as well as conferences for disability professionals and the broader community. 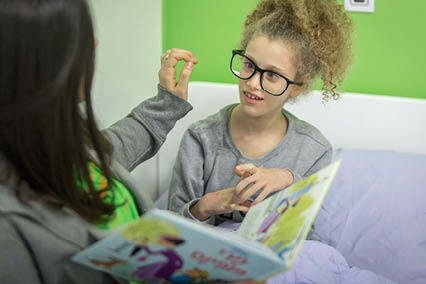 Shalva’s Therapeutic Library and Resource Center houses the largest concentrated collection of disability related literature in Israel; catering concurrently to the families of individuals with disabilities as well as educators, therapists and academics studying contemporary pedagogic models and disability research. Staff librarians and social workers guide visitors in exploring topics like health concerns, family cohesiveness, inclusion, and legal matters. Shalva’s Employment Studio Workshop proves that a spark of creativity inspired by a motivation for independence can produce extraordinary results. 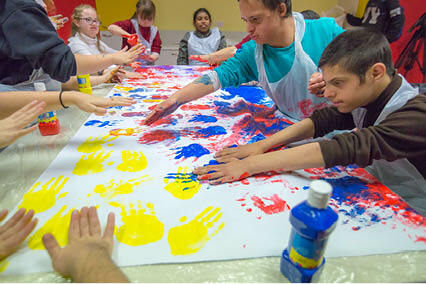 Through guided instruction and inclusive collaborative projects, adults with disabilities learn craft-making techniques, improve their social skills, and advance their independence. Products are sold internationally and at Shalva’s Gift Shop, showcasing the abilities and talents of individuals with disabilities. Shalva’s National Crisis Response program will provide adequate shelter for people with disabilities and a comprehensive, immediate response to their rehabilitative needs during pending periods of national crisis. Shalva’s building is constructed with expansive, disability accessible bomb shelters on every floor and an underground parking lot that converts into a residence facility for 1,200 people. This unprecedented initiative is developed in partnership with the Israeli government and the IDF; including action plans for immediate implementation of country-wide transportation, hundreds of trained volunteer staff, delivery of supplies, as well as ongoing rehabilitative therapies and emotional support. Email info@shalva.org for more information.